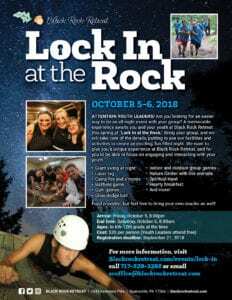 We are excited once again to provide the Lock In October 5-6, 2018. Bring your students for a memorable night full of activities and fellowship, and do so without the stress of planning every last detail. We’ll put our facilities to use for you, providing the program for your Lock In. Registration is simple, just provide the number of students and leaders that will attend and pay 50% of the total as a non-refundable deposit to reserve your spots. Final payment is due upon arrival for the event, providing you with some flexibility as you finalize numbers and who is attending. You will be provided with a health and waiver form that each student must complete at home. The registration deadline is September 21, 2018. For inquiries or to register your group, call or email Ben Herr at (717) 529-3368 or scoffice@blackrockretreat.com.